As an adult, it can be hard to deal with difficulty focusing in work and home life because of the numerous responsibilities. Concentration problems in adult women are often thought of as laziness instead of taking into account the possibility of a condition. However, adults can indeed suffer from focus disorders, and attention deficit disorder in adults is a common cause of an inability to focus and concentrate. Keep reading to learn more about adult ADD/ADHD. Despite the common idea of ADD/ADHD as a disorder experienced exclusively by children, adult ADD/ADHD exists and affects up to 5% of the adult population of the United States. While the disorder must have existed before the age of 12, there are many adults who never receive a diagnosis until well into their adult years. Often, ADD/ADHD in adults presents with slightly different symptoms, which may be more subtle than the symptoms present in children. Concentration problems in adults are not always treated with the same leniency as with children, and are often attributed to a personal failing rather than a medical disorder. Additionally, many of the hyperactive symptoms that are considered - however falsely - a hallmark of ADHD are not present in adults with ADD/ADHD. Adults learn to internalize their urge for movement, and tend to be restless, but will not be as likely to exhibit hyperactive behaviors at inappropriate times. Many adults with ADHD also exhibit symptoms that are not as typical of children, such as mood swings and a hot temper. The impulsiveness that often accompanies ADD/ADHD can also be more prevalent in adults, since adults have more opportunity for grand impulsive actions than children do. There are several life complications that seem to arise from adult ADD/ADHD, as they have been linked to the disorder in many adults. Some of these complications are related to impulsivity, such as a higher likelihood of car accidents or other reckless, endangering behavior. ADD/ADHD can also impact personal relationships, and some adults suffering from the disorder have alienated themselves from their friends and family. Divorce rates are also high among ADD/ADHD sufferers. Other mental illnesses, including substance abuse, are also more likely to exist in people with ADD/ADHD. Depression is among the most likely, because the difficulties that people face due to their ADD/ADHD can influence their self-esteem. Learning disabilities are also common because adults diagnosed with ADD/ADHD have spent their lives with an undiagnosed condition that affects their ability to concentrate and learn. Many focus issues in adults are normal, but if they have lasted since childhood and cause serious complications, it may be a possible sign of adult ADD/ADHD. 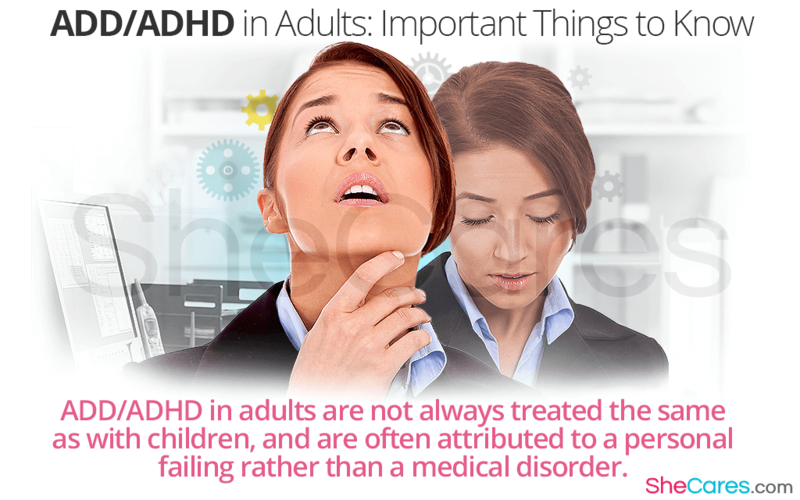 If you think you may have this disorder, learn more about the signs of ADD/ADHD in adults.